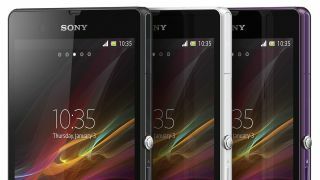 Sony's Xperia Z launches at the end of February, bringing a high-end 1080p resolution screen to the masses. Or at least, to what Sony hopes will be masses of smartphone buyers. Problem is, 1080 x 1920 or 1080p resolution displays are about to become commonplace in 2013, as the phone manufacturers of the world, struggling to compete on power now that EVERYTHING is super-powerful, turn to screen density and display clarity in an attempt to beat their competition. So as well as the Xperia Z, early 2013 will see the arrival of young upstart Huawei and its Ascend D2, also packing a 1080p display measuring some 5 inches, plus its Chinese rival ZTE is launching the equally enormous ZTE Grand S. The latter is another big 5-inch model that again packs a 1080p screen. This time last year, any one of this high-spec trio would've stunned us with the audacity of offering a 1080p display on a mobile phone. But in the fast moving world of Android hardware, we're now in a position where we can be fussy. So let's be fussy. Which one's best? The Xperia Z is scheduled to arrive with Android 4.1 as its launch OS, with Sony promising an update to Android 4.2 shortly after launch. The Sony model features masses of bespoke modifications, though, with Sony incorporating Google's enhanced visual notifications system, adding a custom lock screen, and completely overhauling Android's usual camera and gallery systems. While perhaps a little bland looking, Sony's interface customisations heap on the features and make Android even more versatile than usual. The Ascend D2 is closer to the "stock" Android experience, with Huawei offering Android 4.1.2 as its initial OS. It's still fiddled with a few things, visually speaking, as part of its in-house Emotion UI skin. This means you get a user-definable number of Home screens (up to nine), a reworked camera system and a selection of power and feature toggles in the notifications pane. We'd prefer stock Android to Huawei's skinning, but at least Huawei usually offers us the option to turn most of the maker's customisations off and revert to a more standard version of Google's Jelly Bean code. The Grand S, meanwhile, also arrives powered by Jelly Bean, with ZTE needlessly altering Google's dock icons and widgets, plus the multitasking button we see on most new Android models is absent - the Grand S sticks with the old fashioned Menu button in its below-screen touch button area. There's also the duff TouchPal keyboard pre-loaded for text input, but that's best ditched for the standard Android option. Both the Xperia Z and ZTE Grand S run on a Qualcomm Snapdragon S4 Pro quad core CPU, with the Xperia Z's unit clocked at 1.5GHz and the Grand S maxing it out at a whopping 1.7GHz. That's the same unit that powers the awesome Nexus 4, so while it's not amazingly cutting-edge and thrillingly new in these days of warp speed mobile tech advances, it's still proven to be one of the most capable and speedy chipsets out there today. It'll be taxed a little harder pushing a 1080 x 1920 display around, though. The Huawei Ascend D2 is more of an unknown quantity, in that it's running on Huawei's own newly developed 1.5GHz quad-core processor, so we have no real way of knowing what it'll be like out there in the field when asked to run Super Hexagon for nine hours a day. Sony's Xperia phones have always had superb displays, with the company's blend of BRAVIA tech and the Reality Display thing it likes to talk about doing a great job of keeping everything clear and sharp. The Xperia Z features both those enhancements, boosting the BRAVIA stuff to version two status. What we saw of the new 1080 x 1920 display in our Xperia Z hands on was stunning. It'll be a winner, no doubt about that.